It's likely our ex-colonial readers will be more familiar with this brand of router-centric accessories from Sweden. As word gets round, I've a feeling that could soon change. If you look towards a router table for precision work, especially joint making, you'll be familiar with the need to set either the fence or cutter relative to each other or from the table surface. Valfor's depth gauge goes a step further and enables you to use these references when changing cutters on a single arbor to create tongue & groove joints, for example. The elliptical legs twist to raise the gauge when it's laid flat and establish the height of the cutter while maintaining the depth setting. The flatter your table top is the better, and a chip-free environment is a must if you're to get good results. 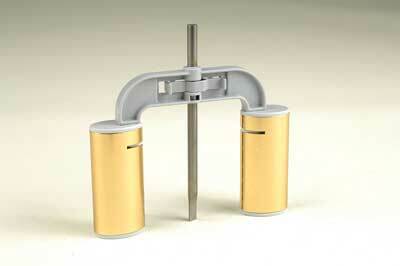 The registering pin locks into place with a cam-style fitting to keep your vital statistics in tact between tasks. Whereas other depth gauges give you height or depth settings, this product has the capacity to do both at the same time.